It’s been a while since I updated my thoughts and review about the Chris Farrell Membership. As you know – especially if you read my original article about Chris Farrell, I am VERY fond of Chris. Not just because he is a talented marketing professional and excellent teacher, but also because he is truly a gentleman. There is something about high personal standards of behavior and language that appeals to me. When Chris is delivering his lectures, examples, instructional videos, or just about anything, he never uses foul language, he is extremely polite and gracious, and he does not speak down to anyone. What this means is that if you are a total newcomer to the field of online marketing and sales, you will feel comfortable in Chris’ virtual presence. You will be comforted to know that you are not alone in your journey toward working online. When I first happened upon Chris, I was searching for information that would help ease my marketing efforts into the growing “social media” scene – and especially Facebook, which I had (frankly) been avoiding. So, when Chris began explaining the importance of Facebook, I was nervous about it since I didn’t quite like the idea of joining the platform. I needn’t have worried, because I simply followed Chris’ instructions – literally, taking each step until I had joined. Now I have 2 different commercial Facebook “pages” (aka “Fan Pages”) that I’ve been working on. This is in addition to my learning how to use Facebook for professional purposes. So, a year or so has gone by, and I was talking about Chris Farrell and his membership to someone, and I thought, “Hmmm… Maybe it’s time I did a little more on this subject and make a video.” And so I got in touch w/ Chris and his company, and told them what I wanted to do. I asked if I could use some of the images from Chris’ website, and they very graciously gave me permission. I would love it if you watched it – I’m including it here. If you happen to be a person who is looking for input about Chris Farrell and his methods, I hope you find it helpful. Best of luck in your online endeavors! I love it! 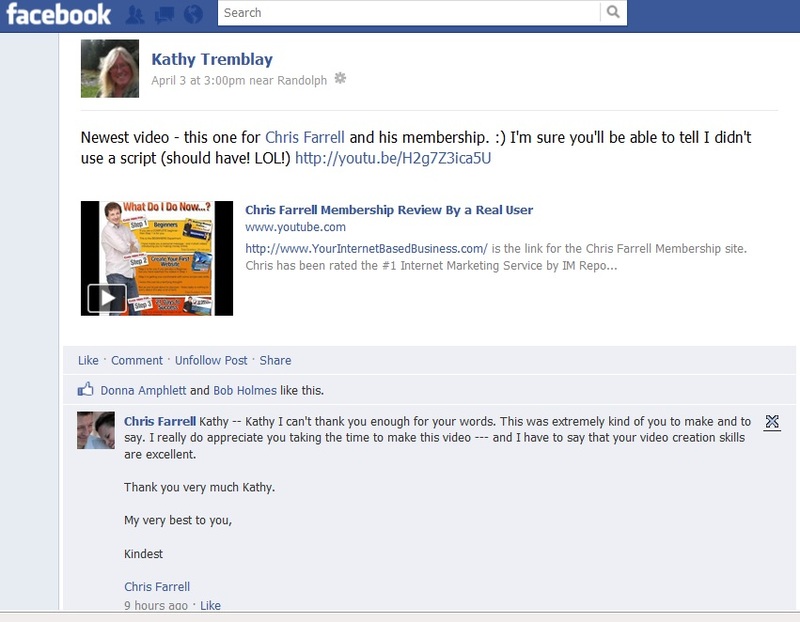 To Give the Chris Farrell Membership a Try Click Here! CLICK HERE to Visit The Chris Farrell Membership and Discover it for Yourself!